Additional historical works by Mr. Wingert are available at bookstores everywhere and on Amazon. "There is a strong sense of community in our area with a deep respect for its history. Crying Hill carries a significant role in that history. It represents an important part of tradition and culture to the Native American community, our very first citizens. "Patrick Atkinson's efforts to preserve the eastern ridge of Crying Hill and efforts to share its significance with future generations plays an importance beyond comprehension to creating understanding of the Native American culture and tradition. "It is our responsibility to generate avenues for awareness. I want my grandchildren to understand, more importantly appreciate, the influences and contributions of the Native American people." To learn more about the culture, richness, and heritage of the Standing Rock Sioux Tribe, click here now. To learn more about the culture, richness, and heritage of the Turtle Mountain Band of Chippewa Indians, click here now. Crying Hill is rich in heritage and sacredness for the Mandan, Hidatsa, Lakota, and Arikara Native American Indian tribes, as well as for all people who live in the Missouri River valley and North Dakota. First and second-hand stories about Crying Hill have been collected in recent years. Crying Hill is a vantage point overlooking the Missouri River basin. Being the highest place in the area, and because of its rounded grandness as it rises from the prairies, it has been sought out as a place for prayer, fasting, solace, and dreaming. One elder from New Town, ND recalls Crying Hill as a place where pregnant girls would go and pray that their baby be born a boy since male babies were very important and highly valued. Crying Hill was also a sacred sight used by the Native Americans to mourn their dead, to pray, and to fast and seek visions and visits from their passed-over loved ones. "The hill was generally a place of solitude and used for praying for the most part. Mourning on this hill can also be interpreted as praying and fasting. The hill provided a place and time for one to strengthen or closely communicate with one's Creator, it also complimented the notion of 'being alone' ....as in the way one feels in a time of grief." "The hill in a symbolic way also represented 'being closer' physically to the Creator..as it may be important for one to feel 'acknowledged' for their needs. Therefore... the hill... being higher in altitude... gave a person the sensation of being closer to the Creator." Mandan historian Juanita Schanandore Maxon writes that... "mourning may take many forms for individuals as well as for gender and tribal affiliation. I know there is much to be said about Crying Hill....."hanbleciya" is a Lakota term for "crying for a vision", or "crying out to God"...perhaps the term Crying Hill stems off of this." "It is said that a year after losing a loved one, and especially with the Mandans, buffalo skulls were put in a circle on Crying Hill. There are many interpretations as to why this was done, but one interpretation is that this was a way of 'giving thanks' for life, and for praying for continued life. "Among the Indian people, both the buffalo and the circle represent life... for the generations to come as well as to those that have passed." While the artifacts, burial towers, and other physical indications of the centuries of sacred use of Crying Hill have been lost to settlers and more modern-day hikers, Crying Hill's heritage has been passed down in the oral traditions of Native American elders, local residents and records located in the city and state historical archives. Crying Hill is still used today by regional Native Americans as evidenced by freshly planted sage, sweet grass, and symbolic stone formations. Crying Hill is also a place of prayer by many groups of non-native cultures, including local Christian groups. It is a play area, a park, and a point of inspiration for the people of the local communities. It is a home of reconcilation. 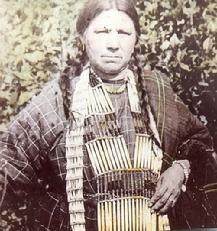 "Mandan was populated by the Mandan Indians and other tribes long before white people came to the area. The Mandan Indians had been here for nearly 100 years when the Verendrye expedition came through in 1738. Good Fur Blanket, chief of the Mandan village at the east end of what is now Mandan (ND) and just below Crying Hill, greeted the expedition. "The village of 250 earth lodges was known as the Village of Crying Hill. Other tribes who inhabited the area at various times included the Chippewa, Yankotonai Sioux, Teton Sioux, Assiniboine, Cheyenne, Hidatsa, and Arikara." Langemo, Cathy A., "Images of America: MANDAN"
Arcadia Publishing, San Francisco, CA. "What legacy are we leaving for future generations? By understanding the beliefs and attitudes of people from different backgrounds, we can build honest and open relationships. Native people need to be understood as a modern people who have a rich heritage and history in this country." 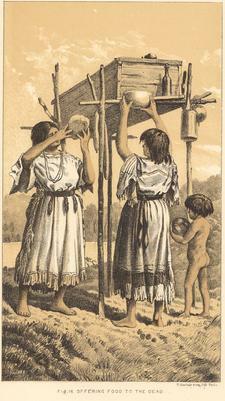 - from "One Church Many Tribes"
1881 Lithograph "Mandan Offering Food To Dead"
The effort to preserve Crying Hill is an ecumenical and nonpolitical effort to preserve historically significant property known both as Mandan Hill and Crying Hill, located on the east side of Mandan, North Dakota. This land is culturally important to the Native American population as a sacred place where, for centuries, members of the Sioux and Mandan tribes retreated, mourned, prayed, and attempted to communicate with their departed loved ones. It is also important to the later settlers who have used it as a scenic spot, recreational site, and place of landmarks and memories. 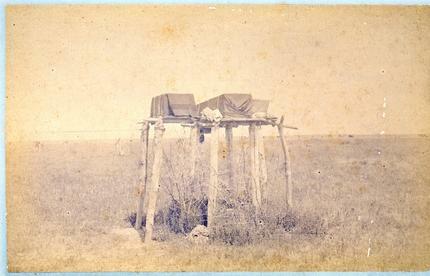 Real 1870's photograph of actual Mandan funeral pyre, of the type used on Crying Hill. “The Mandan Indian village located at the east end of present day Mandan in 1738 was the village of Good Fur Robe. This Mandan chief was revered by his people, and tradition credits him with the performance of many almost miraculous feats of strength and bravery. The tribe kept alive the story of their hero, whose influence determined their customs and manners. “Good Fur Robe’s village was also known as the village of “The Crying Hill,” so designated because the inhabitants used the hill top as their mourning place. The hill formed the north side of the village which was located on the plains below. The intersection of present day Sixth Ave NE and First Street NE cuts directly through the location of Good Fur Robe’s lodge, which according to history, measured 65 feet in diameter. There were approximately 250 other lodges located in the same vicinity. “The village also had another title, which was the village of the “Two Faced Stone.” This stone was a mass of dark red granite, smoothed by the action of glacial flood and ice. It had narrow seams of grayish quartz which crisscrossed its surface. To the imaginative mind of the Mandan Indians, it assumed strange and fantastic shapes of form. In the varying shades of light and shadow, no one ever saw the same symbols twice. Mad Soul, the Medicine Man of the tribe, as well as other wise people of the village, believed that they could fortell the future events of their tribe, or of individuals, by the tracings they saw upon the stone, or the voices which came from the stone. “During the night as he lay at the base of the “Stone” he had a vision. It was a message from a cousin who had met death while crossing the great river (the Missouri) at the time of the spring running of the ice. This cousin had shown him eight white men coming from the north. They had a beautiful cloth held aloft at the end of a slender pole, and were accompanied by several Indians of the Mandan Tribe. “The following morning he reported his vision to Chief Good Fur Robe who immediately called a council of his wise men. They had never seen white men before and thought that they must be very sacred people. Never doubting the prophesy of Mad Soul, they began to make plans to honor the visitors with food and friendship. “Scouts were sent out to watch the river and to signal back the news as soon as this party of visitors came into view. The chief and his wise men began preparations for the strange but welcomed guests. “It was in October of 1738 that a party of Frenchmen, under the leadership of Sieure de la Verendrye, had set out from the present site of Portage la Prairie, Manitoba, to search out the Western Sea. “Early in December the party arrived at a Mandan village which was located not far from the lower loop of the Souris or Mouse River. Here they found a community of 130 huts or lodges, and were told that there were five others along the Missouri even larger than this one. “They arrived at Good Fur Robe’s village on December 22 and were welcomed by the Chief and honored by his tribe. “Lewis and Clark made mention of all of these villages in the diary they kept of their explorations in 1804.